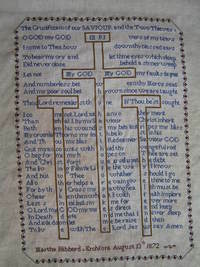 This afternoon, after a year of stitching, I finally finished my sampler. It is a reproduction sampler from 1872 and I bought the chart from a wonderful website http://www.emlis.com/index.htm and found many more! It now leaves me with the problem of deciding what to do next. I do have a couple of projects that are half finished..a lovely Rowan cardigan for Alice, which cost a fortune in yarn, and is only half knitted - if I don't hurry up it will be too small for her. Then there is the wild flower cross stitch plus I have promised Lucy a embroidered picture for her and Alice's new room. I think, more pressing, is the rapidily growing pile of magazines that I need to go through and choose pictures from for my 'inspiration books'. I really do enjoy looking through them and keep them in my special corner of our sitting room. I will post a picture tomorrow.